Restaurants along the waterfront are a mixed bag of good, decent and I can't believe it's still around. When you live along that stretch of the Embarcadero you have opportunity of try a fair number of the places, mostly because they are close and convenient. Sometimes I see these spots that have seemingly been around forever and I think I remember trying that place and wonder why it's been so long since I've been back. One such place is SB40 Restaurant (or Carmen's as it was called for years and is still called by some folks). It's been a waterfront fixture for some time to varying shades of success. It's even had it's own business troubles which you can read about here. Somehow, it has managed to hang on despite all the machinations. I do remember my first time eating here, mostly because it was unpleasant. That was at least 7 years ago. 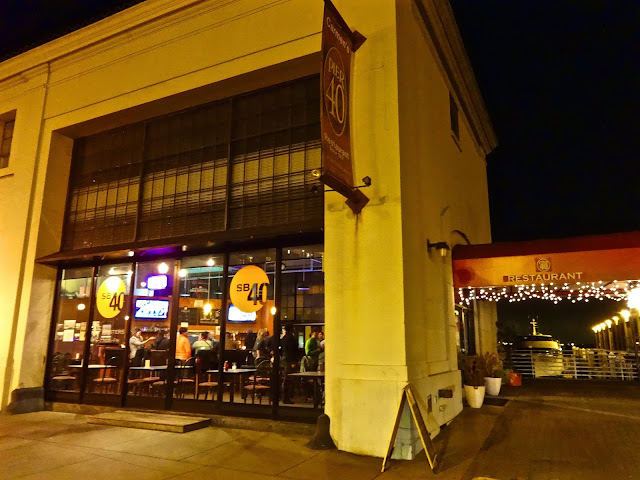 Seeing as how they are still there with a new name and supposedly revamped menu, it seemed like a good time for the SO and I to try them again to see if things were different or if the "song remains the same." The space itself hasn't really changed and as I peruse the menu, that hasn't really changed much either. The do seem to offer $1 oysters and beer specials, which I'm sure appeals to the SF Giants game day crowd. But as a neighborhood resident, I'm totally not interested. 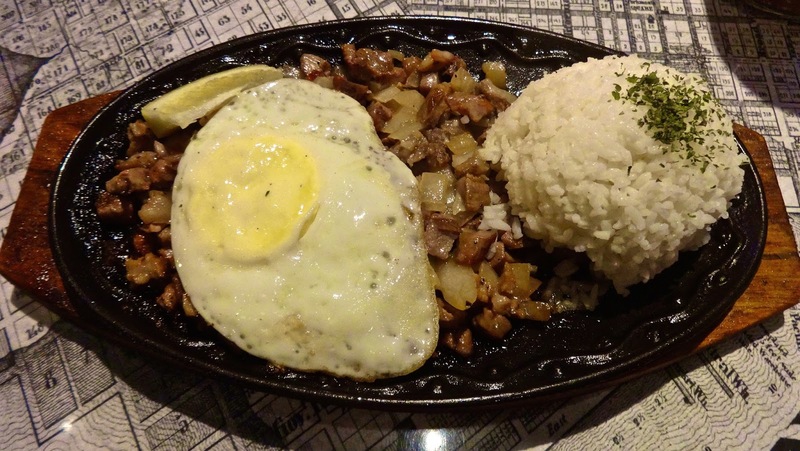 The schtick here is home grown Filipino faves from traditional recipes. Usually, if a restaurant specializes in something, it's best to go with that...usually. 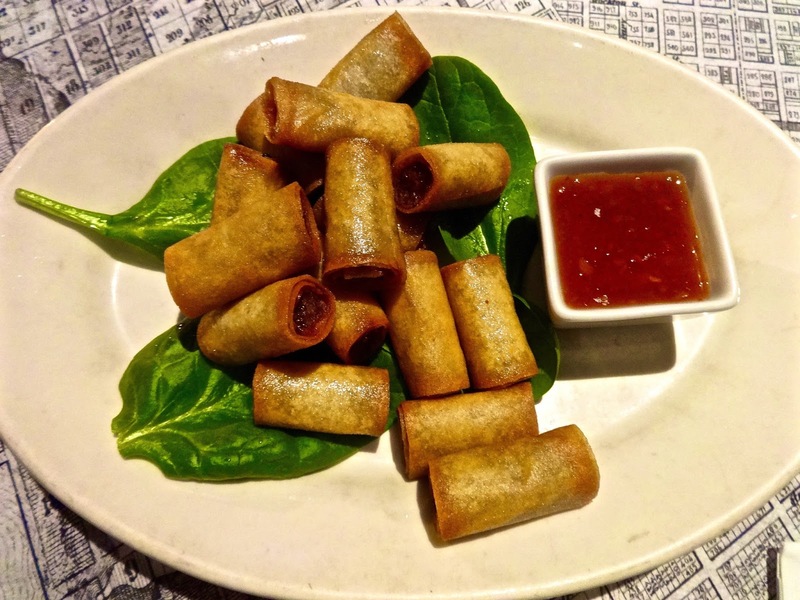 We kicked it off with some lumpia--homemade mini pork egg rolls served with sweet and sour dipping sauce. From a deep fried stand point they were hot and crispy out of the fryer. From a flavor stand point, they tasted like greasy fried phyllo dough. There was some kind of filling on the inside but it was so minute it left no impression. At first I didn't want to eat them as one side roll had the filling looking a little grey and the other side looked a little pinkish. Either way, appetizing. The SO said it would be fine since they were deep fried beyond flavor so I had a few. If I didn't know better I'd say they weren't homemade but pre-made frozen ones they tossed in the fryer. The dipping sauce was definitely from a jar or tub. Either way, it was more like Costco frozen bulk bag party bites than anything else. 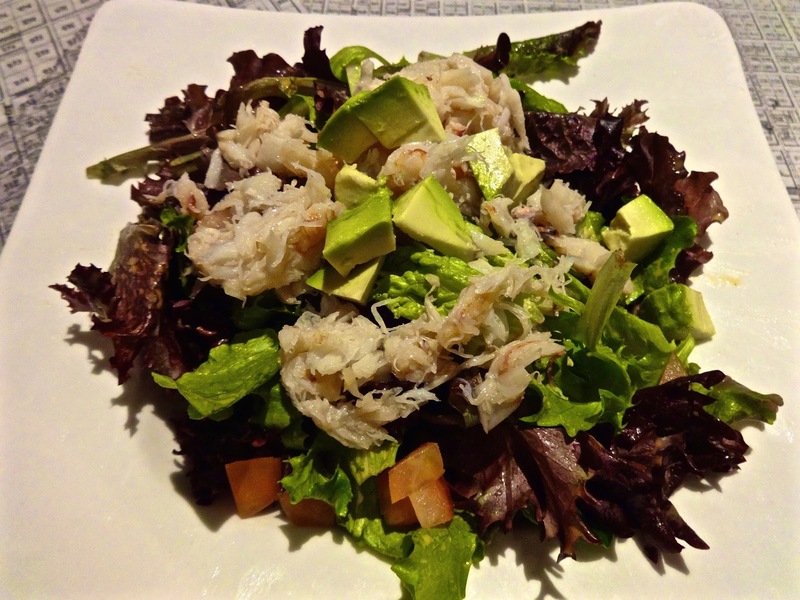 The SO wanted to try something a little healthy thus we got the Dungeness crab and avocado salad with tomatoes and sesame ginger dressing. At $15, it's not that big a salad, the picture makes it seem bigger than it really was. The equivalent of crab on here is pretty close to a single crab cake and it had a very strong odor of crab when it hit the table. It put me off a bit. Otherwise, there wasn't really much to this besides what you see. The sesame ginger dressing was more like a hint as there was barely any on the salad. Plus some of the greens were on the wilted side. I know crab salads are kind of basic but you usually hope places can make them something more than boring and uninspired. Plopping it on some greens is definitely not it. I wanted to try a traditional Filipino dish and settled on sisig--grilled diced meat with onions, jalapeños, served with jasmine rice on a sizzling plate topped with a fried egg. That's the menu description and you have to wonder when it just says meat but doesn't tell you what kind of meat. I'm almost nearly sort of kind of positive that it was possibly pork. I say that because it was very, very salty. Thus it was either pork or they way over seasoned some kind of chicken or beef or whatever. Oddly, outside of the saltiness, this dish really had no other flavor. No spice, no kick, no nothing. I asked for a bottle of Sriracha just dial up the taste. I know I was asking a lot of the Sriracha but I'd already given up hope of this being good so why not. I guess I was expecting something more Southeast Asian flavory but ended up with plain old pork(?) and eggs with rice on a smoking fajita pan covered in salt. Well, at least it got me to drink several glasses of water to rehydrate. Sadly, also, there was no way dessert would be saving this meal as they offered only fried ice cream and brownie a la mode--boring and very Applebee's 1989. Was the food terrible? No, I mean it wasn't on Sinbad level of awfulness, but is was just kind of plain and boring, which makes it close. Like Sinbad's, I wonder how they manage to hang around for so long. I'm guessing the new cheap oyster and beer specials help with game day folks stopping by, I mean one's made by nature and the others are brewed by other companies so they can't really mess them up. Who knows, maybe they have their fans. I mean let's face it, there are any number of restaurants in this town with less than spectacular food that manage to survive in spite of themselves, SB40 seems to be a prime example of that. Too bad it's in my neck of the woods instead of a decent neighborhood spot with good food that I'd actually go back to again.